The Americam cranberry (Vaccinium macrocarpon) is a very dwarf, small-leaved evergreen shrub, cultivated in North America since early in the 18th century. It produces long, slender, creeping shoots which root into the soil; in their second year upright shoots emerge from the axillary buds and, in the third year these bear one to seven flowers. Its acid fruits, which have a high vitamin C content, are chiefly used cooked one way or another. It is such a specialised crop that it is rarely grown in gardens. The species is native to eastern North America and fruits were collected from the wild long before it was cultivated. About 100 selections have been made in the US from the species, and six of seven hybrids have been produced by the US Department of Agriculture since a breeding programme was started in the 1920's. The native British cranberry (Vaccinium oxycoccus) is not grown commercially, but quantities were picked in earlier times in northern England and in Scotland for sale in local markets. Another related species, Vaccinium vitis-idaeus (lingon or lingberry) is grown commercially on a small scale in Europe. 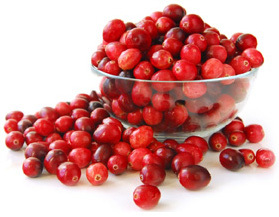 American cranberries need a cool moist climate, but have exacting requirements for site, namely very acid soil (pH 4-5), usually peaty, and control of soil water level. Artificial ‘bogs’ are created for their cultivation, for it is common to flood the plants during the winter to protect them from frost damage. The bogs may also be flooded for short periods at other seasons for pest control, irrigation and harvesting. A long, narrow bog is easier to flood and drain. Sunny conditions are essential for satisfactory flowering. Very well-drained soils are required. Before planting, the top layer of soil is removed together with unwanted flora and tree roots, to be replaced by 7.5-10cm layer of coarse sand, into which the cranberries can quickly root. Although cranberries are self-fertile, colonies of bees brought in at flowering generally improve yields. In North America, cranberries are planted in late spring, placing cuttings at about 15-45cm apart each way (depending on area), and then pressing them into the sand layer with a disc harrow. It is important that the plants become established quickly in order to compete effectively with weeds, and the bog may be flooded for a short period to settle in the cuttings. A new bog will start to fruit in its second or third year, but it will take up to five years for full production. Bogs will last for 60-100 years. Conventional cultivation is not required as the crop covers the ground completely, but every third year a further 10cm-layer of sand is spread over the surface after harvesting, to renew the rooting medium: this technique also helps to control weeds. Cranberries grow in poor soils, so feeding can be difficult. Too much nitrogen will induce shoot growth at the expense of fruit production. Research in Massachusetts has shown that the nitrogen requirements of a bog are related to the length of upright shoots produced: if less than 2-5cm, relatively high amounts were needed, if more than 5cm, none was needed. In the hard winters of the Northeastern US bogs are flooded to 15-18cm, so protecting shoots from desiccation by drying winds at a time when the roots could not supply water from frozen soil. Pruning is not necessary. The fruits ripen in autumn over about six weeks according to cultivar, and are picked over several times. Comb-like tools have been developed for quicker harvesting, and machines are now commonly used in the US. The disadvantage of dry harvesting by machine is a 20-30% loss of crop. Bogs are often flooded at picking; this is ‘wet picking’. Fruits are knocked off the plants by so-called eggbeaters and float on the surface, being collected with the aid of strings of poles and planks. These fruits must be artificially dried. Cranberries mat be kept in storage at 3ºC until Christmas. Propagation on a small scale is carried out by taking shoots 15-18cm long, in early spring, which are inserted in a sandy mix in a propagating frame and covered with plastic film. Cuttings may also be taken in summer and rooted in the same medium, under mist at 20-25ºC. The principal cultivar in the US is ‘McFarlin’, grown in both eastern and western states. ‘Howes’ is the standard cultivar of New Jersey and Massachusetts. Newer cultivars from the USDA programme are ‘Beckwith’, ‘Bergman’, ‘Franklin’, ‘Stevens’ and ‘Wilcox’. ‘Hamilton’, from the Arnold Arboretum, is very attractive as an ornamental cushion plant and also has a good red fruit. CRANBERRY; AMERICAN CRANBERRY; LARGE CRANBERRY. Procumbent shrub, forming large, flat mats, evergreen; stems creeping, to 1m. Leaves 1-2cm, elliptic-oblong, margins flat or slightly involute, dark green above, tinged white beneath. Flowers axillary, few; pedicels long; calyx cupulate, shallowly 4-lobed; corolla deeply 4-lobed, lobes reflexed, 1cm, light purple; stamens strongly exserted. Fruit globose, 1-2cm, red, very acid. Summer. Eastern N America, N Asia. ‘Hamilton’: miniature, non-vining, slow growth; flowers small, pink. Z2. 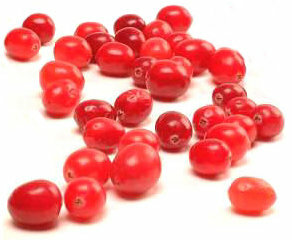 EUROPEAN CRANBERRY; SMALL CRANBERRY. Dwarf shrub, prostrate, evergreen; shoots filamentous. Leaves 5-10mm, ovate-oblong, margins involute, deep green above, tinged blue beneath. Flowers generally in clusters of 1-4, rarely in small erect racemes; calyx cupulate, generally 4-lobed; corolla deeply 4-lobed, lobes reflexed, light purple. Fruit globose, 6mm, dark red, rather sour, persisting on plant throughout winter without rotting. N America, N Eurasia. Z2. COWBERRY; FOXBERRY; MOUNTAIN CRANBERRY; CRANBERRY. Shrub, creeping, 10-30cm high, evergreen. Leaves 1-1.5cm, obovate to obtusely ovate, often emarginate at apex, glossy green above, lighter green and black-punctate beneath, coriaceous. Inflorescence subterminal, racemose, small; calyx 4-lobed; corolla campanulate, white to pink, 4-lobed, lobes rather large. Fruit globose, 6mm, bright red, edible. Late spring-early summer. N Eurasia, Japan, N America. Z5. variety majus. Flowers larger. Leaves to 4cm. variety minus. MOUNTAIN CRANBERRY; ROCK CRANBERRY; LINGBERRY; LINGEN; LINGENBERRY; LINGONBERRY. Alpine form, forming dense mats 10-20cm thick. Leaves 8-15mm. Flowers pink to red. Arctic N America. Z2. Other tasty berries you might like to try and cultivate are Bilberries, Blaeberries, Huckleberries, Whinberries and Whortleberries. 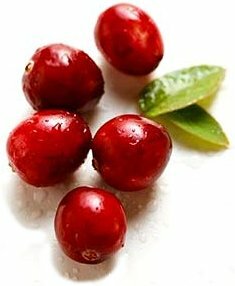 Since they are of the same genus as Cranberries (Vaccinium) they are included below. DOWNY SWAMP HUCKLEBERRY; BLACK HUCKLEBERRY; BLACK HIGHBUSH BLUEBERRY. Copiously branched shrub, 1.5-3m, deciduous. Leaves 3.5-7 x 1.5-3cm, elliptic to oblong, entire, acute, deep green, glabrous above, densely pubescent beneath. Inflorescence axillary and terminal, of short compact leafy racemes; corolla cylindric-urceolate, pink or green flushed red, lobes 5, small, triangular, erect or spreading. Fruit globose, 6-8mm, dull black, sweet-tasting. Late spring. Eastern N America (Canada to Alabama). Z4. ‘Leucoccum’: fruit translucent, white tinged green or yellow. DWARF BILBERRY. Shrub, rapidly spreading, densely branched, 10-25cm high, deciduous; shoots glabrous. Leaves 1.5-3.5cm, elliptic to obovate, entire to finely serrate, glabrous. Flowers solitary in basal leaf axils, pendent; calyx margins undulate; corolla ovoid-urceolate, 5mm, pink to off-white, lobes 5, small, usually erect. Fruit globose, 6mm, blue-black, pruinose, sweet-tasting. Late spring-summer. Northern and Western N America (Labrador to Alaska, south to New York, Minnesota, Colorado and California). Z2. BLUEBERRY; AMERICAN BLUEBERRY; SWAMP BLUEBERRY; HIGH BUSH BLUEBERRY. Shrub, erect, 1-2m, deciduous; branches yellow-green, glabrous or somewhat pubescent, warty. Leaves 3-8cm, ovate to lanceolate, enitre, orange to scarlet in autumn, veins somewhat pubescent beneath. Flowers in dense clusters; calyx tinged blue; corolla tubular-urceolate to narrowly ovoid, 6-10mm, white to slightly rufescent. Fruit globose, 8-15mm, blue-black, very pruinose, sweet and good-tasting. Late spring. E US. Z2. variety albiflorum. Leaves finely minutely serrate to ciliate-serrate, bright green. variety glabrum. Leaves minutely serrate-ciliate, glaucous, wholly or almost glabrous beneath. ‘Blue Ray’: leaves dark green in summer, burgundy in winter. ‘Blue Crop’: hardy; leaves bright green in summer, fiery red in winter. ‘Tomahawk’: leaves brilliant orange in autumn. THIN-LEAVED BILBERRY; BLUE HUCKLEBERRY; MOUNTAIN BLUEBERRY; BILBERRY. Shrub, erect, 0.5-1m, deciduous; shoots angular, pubescent when young. Leaves 2.5-6cm, elliptic to oval-oblong, acute both ends or rounded at base, finely serrate, very shortly petiolate, very thin and membranous. Flowers generally solitary, axillary; pedicels short, rufescent, glabrous; calyx entire; corolla globose-urceolate, 6mm, white tinged green or flushed very pale pink. Fruit globose, dark purple, not pruinose, edible, delicious but sour. Summer. Western N America (Michigan, Alaska to California). Z6. MORTITIA. Shrub, procumbent, 30-100cm, evergreen; shoots long, spreading, rooting, dark brown-tomentose when young. Leaves 8-15mm, very crowded, ovate, acute at apex, rounded at base, finely glandular-serrate, dark green above, lighter beneath, coriaceous, sparsely glandular-pubescent beneath. Inflorescence axillary, racemose, dense; corolla tubular-urceolate, 5-8mm, very pale pink; stamens pubescent, anthers not awned. Fruit ovoid, 5mm, red, pruinose, edible. Early summer. Ecuadorean Andes. Z9. BILBERRY; WHORTLEBERRY; WHINBERRY; BLAEBERRY. Shrub, strictly erect, 30-50cm; shoots angular, green, glabrous. Leaves 1-3cm, oval-elliptic, finely serrate, shortly petiolate, glandular-pubescent on veins beneath. Flowers solitary, axillary; calyx scarcely lobed, green; corolla globose-urceolate, 6mm, tinged green, often becoming red. Fruit globose, 6-10mm, blue-black, pruinose, good-tasting, with coloured juice. Europe to N Asia. Z3. ‘Leucocarpum’: fruit dirty white. MATHERS; TALL BILBERRY; OVAL-LEAVED BILBERRY. Shrub, openly branched, 1-3m, deciduous; shoots angular and glabrous when young. Leaves 2.5-6cm, elliptic to ovate, entire, obtuse, pale green above, tinged blue beneath; petioles 1-2mm. Flowers solitary, axillary; pedicels short; calyx cupulate, very shallowly lobed; corolla ovoid urceolate, 9mm, pink. Fruit subglobose, 1cm, dark blue, pruinose, mildly sour, edible. Early summer. Canada, N US. Z3. RED BILBERRY; RED HUCKLEBERRY. Shrub, erect, to 2m in cultivation, often much taller in habitat, deciduous; shoots angular, slender, glabrous. Flowers generally solitary, pendulous, shortly pedicellate; corolla flattened-globose, 6mm, tinged green with a hint of red, minutely 5-lobed, lobes reflexed. Fruit ellipsoid, 12mm, coral-red, slightly translucent, edible. Late spring-early summer. Western N America (Alaska to California). Z6. BOG WHORTLEBERRY; BOG BILBERRY; MOORBERRY. Shrub, stiffly erect, densely branched, to 5cm, deciduous; shoots cylindric, generally glabrous. Leaves 1-3cm, elliptic to obovate, entire, subsessile, green tinged blue, pubescent beneath. Flowers solitary or in pairs; corolla urceolate, 4mm, very pale pink, shortly 4-lobed, lobes spreading; calyx shortly 4-lobed; stamens glabrous. Fruit 6mm, blue-black, pruinose, juice not coloured, sweet-tasting. Late spring-early summer. N America, N Europe. Z2. 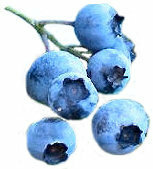 DRYLAND BLUEBERRY; SUGER HUCKLEBERRY; LOW BILBERRY; EARLY SWEET BILBERRY; LOW BLUEBERRY; LOW SWEET BLUEBERRY. Shrub 20-50cm, often in extensive colonies, deciduous; shoots spreading, green or yellow-green. Leaves 1.5-3cm, elliptic-spathulate to broadly elliptic, entire to finely serrate, obtuse to subacute, pale green or glaucous, glabrous or minutely pubescent. Inflorescence racemose, few-flowered; calyx rufescent; corolla tubular, 5-7mm, yellow-green, somewhat rufescent. Fruit globose, 4-5mm, dark blue, somewhat pruinose, edible. Late spring. E US (Maine to Minnesota, to Georgia, Tennessee and Missouri). Z6. variety crinitum. Twigs and underside of leaves pubescent.